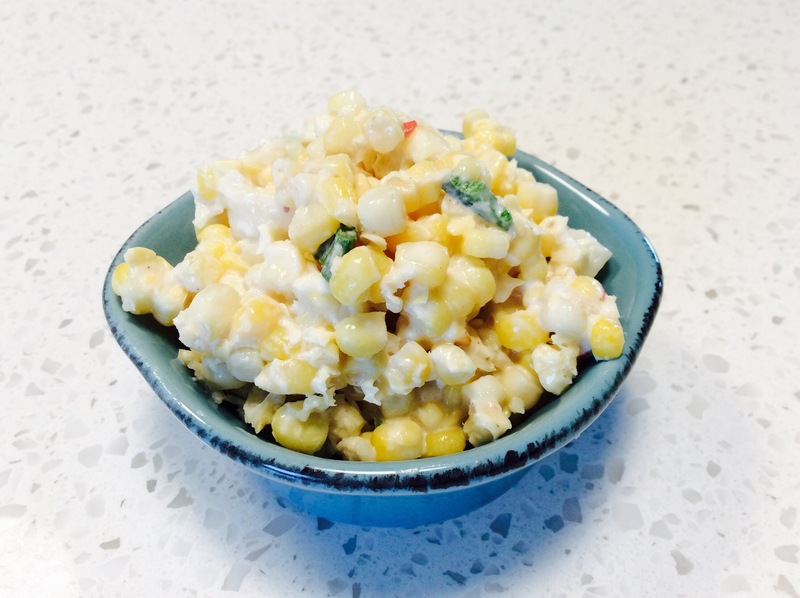 My husband and I whipped up these recipes yesterday after not finding immediate takers for some of our sweet corn. We wanted to make sure the deliciousness didn’t go to waste, that would have been a shame. BUT, we didn’t want just plain corn as I had already processed two previous batches of the stuff. This had us contemplating more complete side dishes. He had heard a guy friend from work mention something about freezing corn with sour cream or cream cheese (he couldn’t remember which). It was supposed to be utterly amazing but unfortunately we didn’t have the recipe. So, in true Dirt On My Plate fashion, I set to work using a little culinary creativity. That, and my husband’s willing tastebuds. The following recipes are guesstimates because I did not write everything down as we went along. Just remember, taste, taste, taste and let that be your guide. The sky is the limit! **TIP** The less corn you use, the more creamy the end results will be. 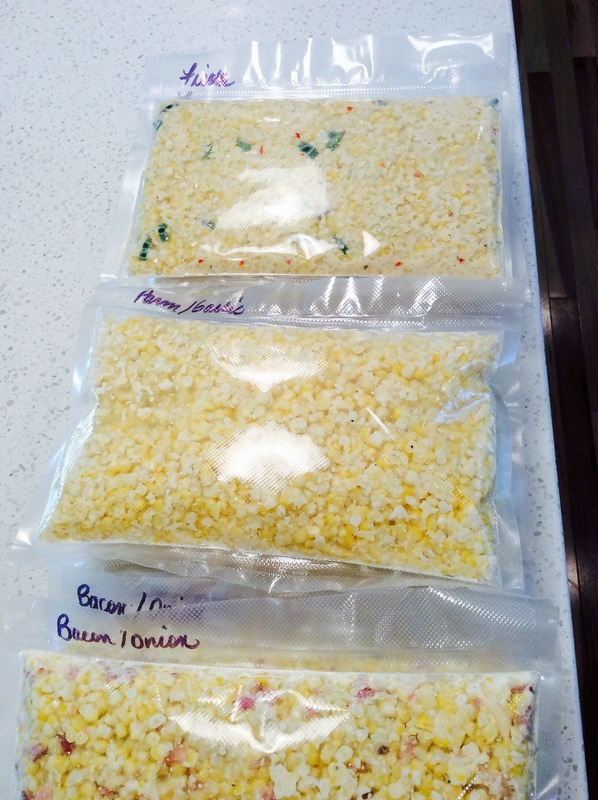 I have to say, my husband was over the moon being able to help me make and vacuum pack this corn for the winter. He plans on using some of what we stored for creamy corn dip. With the seasonings already present, preparation will be super simple. Heat corn and melt in cream cheese. Remove from heat and stir in 1 & 1/2 cups of cheese. Add the corn mixture to an oven safe dish, top with remaining cheeese. Place under a the broiler for 5-10 minutes until cheese is bubbly and golden. 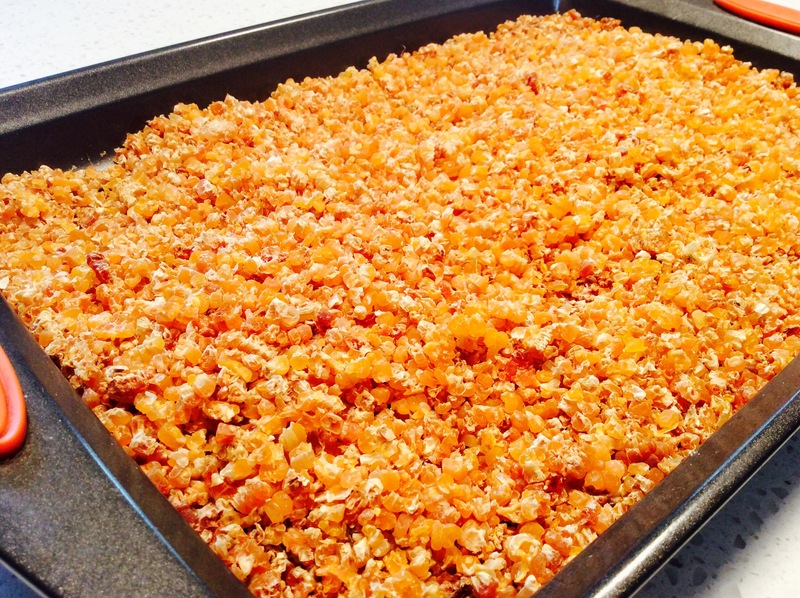 Serve with tortilla chips, crackers or fresh baguette. On top of our frozen corn creations my husband wanted to try drying some corn. Trust me, I do not know where this man gets his creativeness from but for the love of corn he’d do just about anything. Forgive my digression. Dried corn, his idea was to possibly grind it for homemade cornmeal so I could make him cornbread – another one of his favorites. According to various online sources, we blanched the ears of corn prior to removing the corn from the cob. Spread out on trays, 3/4 to 1-inch thick it was placed in a 175 degree oven for 8 hours. Every so often the corn was turned to allow for even drying. At the end of 8 hours we combined the three trays into one. The heat was shut off and the corn was allowed to sit in the oven overnight to ensure everything was completely dry. The corn can be ground at this point or stored as is. 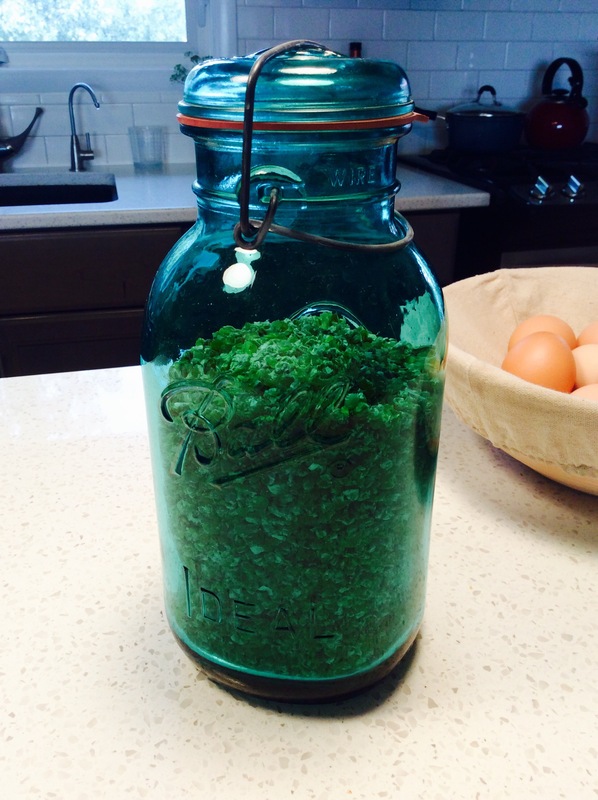 I chose to add the corn into a bale-top jar for the time being. I’ll save the “fun” of grinding it for my husband! Whole dried corn such as this can be added to soups and is wonderful for shelf stable storage. Our overall consensus at this point is mixed. Drying corn was a lot of work for very little final product. I think it gave us a greater appreciation for the ease of buying prepared cornmeal from the grocery store. As far as the cream cheese sweet corn combination, I’m pretty certain what vegetable my husband will want with his meal this winter. It was definitely a tasty adventure for us to take together – I may have to get him his own apron! Deep Discounts On Amazon? Looking For Coupon Codes? Learn More About Where I Find The Good Deals!